Cleveland High School mathematics teacher Valerie Capps received the University of Tennesee Dorothea & Edgar D. Eaves Award at the UT Department of Mathematics Honors Day 2019 Awards Ceremony in Knoxville last Thursday. 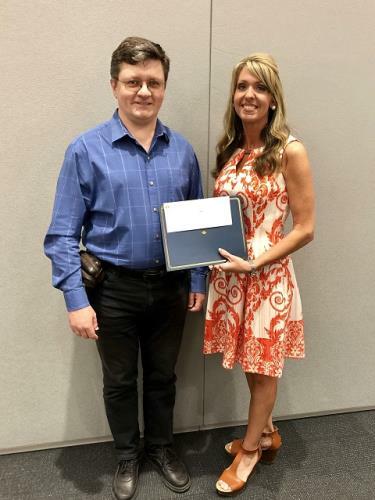 This award is given to encourage high school mathematics teachers to return to The University of Tennessee during the summer to further the study of mathematics. A graduate student in the Masters in Math program at UTK, Mrs. Capps currently teaches pre-calculus honors-dual credit and algebra 2 at Cleveland High School. Mrs. Capps has been a math teacher at Cleveland High School for 15 years and serves as National Honor Society Chapter sponsor and co-chair of the Prom Committee. She is also an adjunct professor of mathematics at Lee University. A Cleveland native, Mrs. Capps was valedictorian of Cleveland High School, then graduated with a bachelor of science from Bryan College. She has a masters in education degree in administration & supervision and an education specialist degree in curriculum & instruction from Lincoln Memorial University. She has also coached girls basketball, girls soccer and girls track at Cleveland High School. Mrs. Capps and her husband Robert have two daughters.